In 2015 author Ed Klein told Sean Hannity that Barack Obama’s former pastor Reverend Jeremiah Wright helped Obama accept Christianity without having to renounce Islam. Klein also said Wright told him he “made it comfortable” for Obama to accept Christianity without having renounce his “Islamic background,” which Klein said he has on tape. 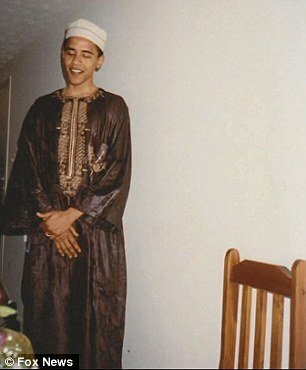 Last night Bill O’Reilly released newfound photos of Obama in Muslim garb. Bill O’Reilly shared photos of Barack Obama in traditional Islamic dress on his program Wednesday night claiming they were from his half-brother Malik’s wedding. The Fox News host said it was ‘very difficult’ to verify the exact location of the photographs – a similar set of which were first released back in 2004 by Malik and previously published on DailyMail.com – but claimed they were taken in Maryland in the early 1990s. ‘According to his half-sister, Barack Obama attended his half-brother’s wedding in the early 1990s. Malik Obama was a Muslim,’ said O’Reilly. Malik was married in 1981 for the first time and President Obama was his best man at that ceremony. He now has multiple wives.